The goal of your food truck website is to attract customers and provide them with information about your products and services. All too often, poorly designed websites lack the key ingredients needed to successfully convert visitors to customers. Use the following elements on your website to maximize your chances of converting the site’s traffic into paying customers. Your home page is the most important page on your website because it gives your visitors their first impression of your business. Within seconds of arriving at your home page, visitors will decide whether it’s worth their time to browse through the remainder of your site. What should go on your home page? A prominent photo: Pick a great image of your truck, your logo, or perhaps your signature dish. Some well-written text to complement the photo: This text should tell people what you and your food truck are all about and how it differs from other dining experiences the visitor may have had. Make it short and compelling; if it’s too long, people simply won’t take the time to read it. Don’t make it difficult for people to find where your food truck is located. Instead of simply listing your business mailing address, display an easy-to-read map and directions. The easiest and quickest way to display a map to your food truck is to use Google Maps and embed the visual on your website. Due to the mobile nature of your truck, you’ll also want to include a feed that displays your most current Twitter messages. This feed allows a guest on your site to track you down or at least get an idea of your most frequented locations. Your menu is the main marketing tool on your website and your opportunity to make your visitors’ mouths water; don’t forget to include some enticing pictures of your dishes. The key to adding your menu is to make it accessible. Don’t provide a downloadable PDF copy of your food truck menu. These PDFs can take a very long time to load, especially for people who are trying to view your menu from their mobile phones. PDFs also provide no search engine optimization (SEO) benefits for your website. Take the extra time to create a dedicated menu page on your website. Make sure it includes descriptions of the food along with photos of these menu items. Showing your hours of operation and the days you have your truck hit the streets saves your customers the time it takes to monitor your daily Twitter updates if they’re not Twittaholics. By adding your days of operation, you also allow your customers to plan their schedules so they can meet your truck when you’re in their area. People love to see the fantastic designs food trucks have been wrapped with. They also like to see what the food looks like before they decide to eat at a particular truck. 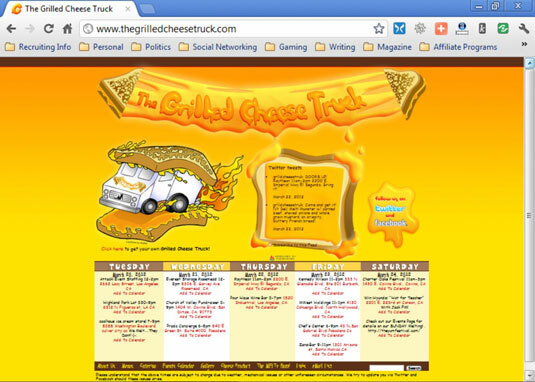 For this reason, food truck websites should include a photo gallery (in addition to the photos on the home page and with the menu). Hire a professional photographer or have your staff get some pictures during a food truck event or during one of your busy times to capture the visual portion of your food truck’s atmosphere. You can then display the photos on your website in a simple photo gallery. Developing a casual dialogue with your customers: A blog allows you to speak casually to a wide range of people, including your customers and potential customers. Through a blog, and through blog comments, you can create a casual conversation that builds real relationships. Communicating quickly: A blog allows you to provide up-to-date information to your customers quickly and easily. Updating your blog is much easier than updating your website, and it requires no special technical skills. Increasing search engine visibility: As you blog about topics such as events you’ll be attending or new menu items you plan to add, you increase the visibility of your business in search engine results for these topics. Sharing multimedia content: With a blog, you can easily embed other types of content, such as videos and podcasts. Making you the expert: A blog allows you to showcase your knowledge about the mobile food industry. As other people discover the benefit of your knowledge, you’ll be seen as an expert in the field.